It’s always interesting for Recognition Express Mid Surrey owners Adam and Sally Findlay to learn more about the story behind the clothing and products they supply to customers. But one recent project has almost literally blown them away! They’ve been involved with Kingston University for many years as a supplier of promotional and branded products. 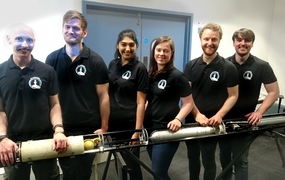 Sally also mentors female engineering students, so they were delighted to provide logoed polo shirts for a team of six fourth year MEng students working on the final stages of the Astro department’s three-year programme to develop and launch a sounding rocket. The experience has been fascinating for the husband and wife team as they have been fortunate enough to be kept informed of the project’s progress at each stage. A test firing of the rocket, which will be used to launch equipment capable of taking measurements and carry out scientific experiments, is due to take place shortly. Said Recognition Express director Sally Findlay: “As a mentor of female engineering students at Kingston University it has been really interesting for us to learn more about the work they are doing and get involved even in a very small way with such an exciting project. Space travel and rockets capture everyone’s imagination and this project showcases the engineering excellence of Kingston University at its very best. “Our polo shirts look very smart too! The students designed, developed and assembled the prototype rocket which will be capable of reaching an altitude of three kilometres and return safely back to the ground with minimal damage. The team has been in contact with the UK Rocketry Association to get the rocket design signed off and permission to launch. The Astro department hopes this project will pave the way for further development into higher altitude rockets. Said rocket team member Karine Murray: "I have thoroughly enjoyed being part of this project as it has given me a practical understanding of engineering and invaluable skills which I can now take forward into industry. "I have always been interested in space and rockets which has made this project all the more enjoyable. It has been both challenging and fun to build this rocket and it has put everything I've learnt during this course to practical use."